MEREDITH VIEIRA, co-host: But let's begin with the latest on that record-setting heat wave here in the East . NBC 's Ron Allen is just down the road in Times Square . Ron , good morning to you. RON ALLEN reporting: Good morning, Meredith . It's already pretty hot down here. We have a thermometer nearby, of course, and it's -- you can see that it's creeping up already. It's about 87, 88 degrees. It's never got much below the mid-80s overnight, the overnight lows. Those are the kind of numbers you expect to find as the average highs for this time of year, of course. It's going to be another absolute scorcher. The East Coast will spend another day in this heat wave desperately looking for relief. That's an emergency medical team trying to get ahead of the heat wave . They're checking in on hundreds of Washington , DC , residents who've called 911 for help in the past. They found 71-year-old Mary Reid with just a small fan to keep cool. Unidentified Emergency Worker: Are you handling the heat just fine? Can I offer you some water? Ms. MARY REID: Yeah, I'll take a water. ALLEN: She gets a brief medical check and the team moves on. Ms. MYTONIA NEWMAN (Public Health Coordinator, DC Fire EMS): When we look back through the database, we want to find people who are elderly, those who are disabled that can't get out. ALLEN: The sweltering heat baked most of the East Coast ; as many as 30 locations from Baltimore to Boston reached triple digits. New York hit 103, Baltimore topped that at 105. Wilmington, Delaware , at 103 had its hottest day since 1936 . TONY PANN reporting: Well, we have the big time heat going on this afternoon. ALLEN: Weather advisories remain in place again today, warning of potentially dangerous conditions. Imagine what it's like working outdoors. Unidentified Man #1: When you're out in the sun, it's stifling. Man #1: It really is. It's just draining. ALLEN: Even the president warned the press. President BARACK OBAMA: Stay cool out there. Unidentified Man #2: Thanks, Mr. President. ALLEN: The young players at this soccer camp in New York added a lot of water to their practice. They also shortened the day. Unidentified Man #3: Well, obviously with soccer there's a lot of running around, so we just want to make sure that that's limited, that there's increased amount of time resting time and just make sure they've got lots of fluids inside of them. ALLEN: In Philadelphia , they closed playgrounds because of the heat. Today, power companies remain braced for blackouts. New York predicts demand will surge to its highest level ever, with temperatures expected to stay at 90 or above until the weekend. Despite the heat wave , so far only scattered outages have been reported throughout the region. That heat wave is also impacting the morning commute and in ways you may not have realized. In some places there are power lines that are actually drooping. There are rails that are actually expanding, so trains are being forced to go more slowly. There are delays, and in some places there are even cancellations. We're going up to 98 today here in New York , perhaps another record. Meredith , back to you. 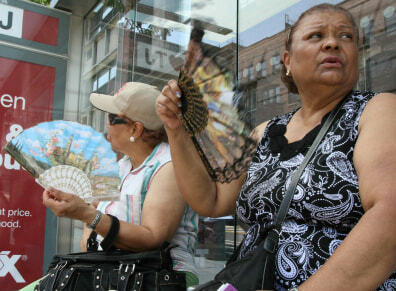 Nancy Calex, right, and Zoraida Pena fan themselves as they wait in the heat for a bus Tuesday in New York.